I told myself I'd sell this 60's Fender Ecco-fonics tape echo I have but at certain times (maybe a little less frequently than I would like) it really shines. It's a great dirty delay for guitars. It adds a lot of meat to the overall tone. It does a great job of building spontaneous repeats as is shown in this video. I brought this in as some ambient tape effect noise but ended up not using it in the end. I'm currently producing the new record by LA's garage poppers So Many Wizards and I was looking for a clarity and flexibility in the guitar tone. I decided to go with the classic combination of the MD421 and an SM57. These two mics are complimentary and when tracked separately, you can alter the tone quite a bit by changing the volume balance between them. I had to purchase a 421 since I didn't have one. They're common and have been in production since the 60's so there's many incarnations and I was unsure which would be best. Thanks to good advice from Jack younger from Watch City studios I have discovered the blissful sound of the 70's MD421-U5. The U5 has a 4 stop low end filter which allows for some serious control of the low end through the actual mic. In lieu of the SM57 (all 3 of mine were drowned in a flood) I have an old Unidyne 545 which is the precursor to the SM57. I actually prefer this mic to a new 57 but not by much. I once read the 545 was used on bass during the Beach Boys' Pet Sounds sessions. This will surely be a mic combination I will be coming back to again and again. I'm thrilled to present the first post on this new Trabants recording blog. Things can get pretty interesting while making Trabants records so I thought this space could be used to give some insight into the process. Cinematic was recorded in Boston and Los Angeles. It's follow-up is the first Trabants record I'm tracking and mixing completely in Los Angeles. I've enlisted some local help (adding to the ever-expanding family tree) to shift the vibe a bit. Drums were tracked at Grandma's Dojo in Ktown with Miles Senzaki whom I chased down after seeing him rule the old school soul sound in his band Breakestra. This was one of the smaller rooms I've used to track drums so things felt way smaller than the cinematic drums which have a sort of "warehouse" bigness to them. 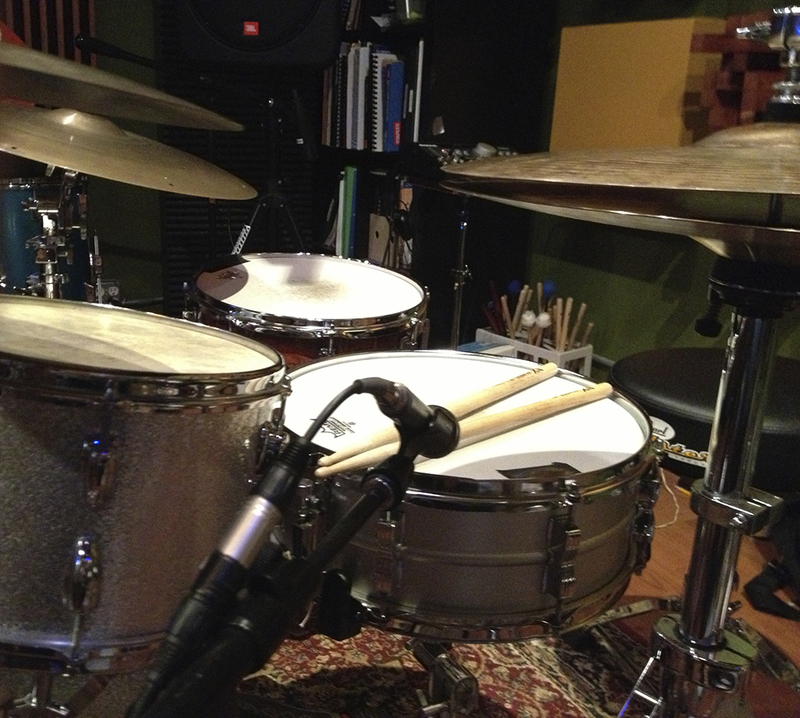 Miles owns a newer pair of Coles 4038s so I maintained them as my overhead mics of choice for Trabants' drums. 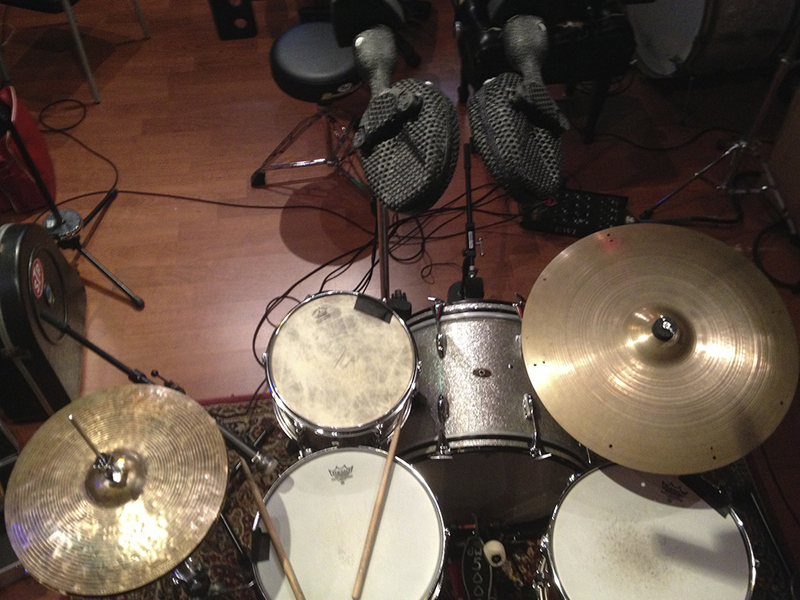 I used my AKG D12E on the kick and the AKG D-19C on snare. We used one ambient room mic also which I can't recall specifically.